Added on 22 August 2018 . By Jess Halladay. Looking for a place to grab some good grub and catch up with a mate? Well, as the name suggests, Scoff & Banter Kensington is a perfect place to do just that. 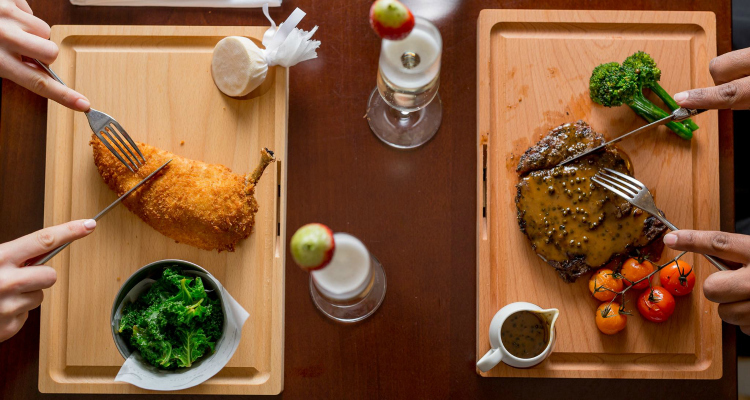 This fine dining British restaurant brings together classic dishes in a contemporary English setting and with three further locations in Oxford Street, Bloomsbury and Canary Wharf, it’ll be an easy journey to get to wherever you’re coming from. The interiors of Scoff & Banter's Kensington joint mix classic English design with modern touches. You certainly know you’re in one of London’s Royal Boroughs when the restaurant is set in an iconic mansion, located just off the main high street from Gloucester Road tube station. Feeling ‘fancy’ in my denim skirt and sandals (eek!) I head up the steps to a warm welcome from the friendly bartender. The whole venue has a very open, laidback feel thanks to the high ceilings, with low hanging lights and dark interiors offsetting the brightness of the natural light coming from the bay windows. 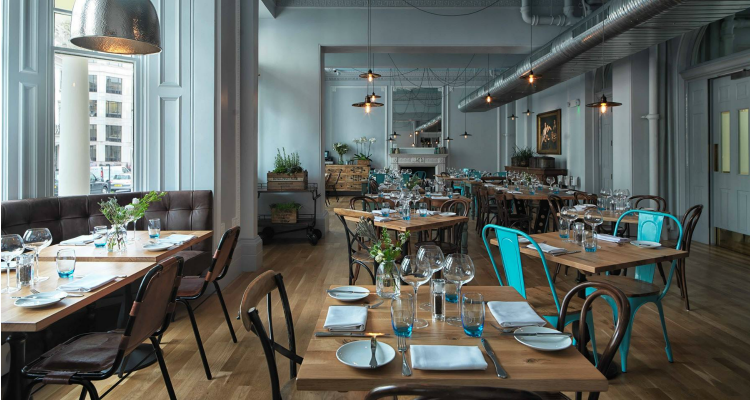 The vibe is modern British brasserie through-and-through, with the bar boasting window seating and comfy couches to sip some drinks on, and the adjoining restaurant offering pristine dining tables ready for the feasting. The waiting team further heighten the atmosphere with their skilled attention to detail and welcoming presence. Our waitress, Valentina, could not have been more helpful, checking in with us between courses to make sure we felt well looked after - a quality of service given to all diners. The food here is all about taste and comfort with a bit of extra panache. Dining out in celebration of a birthday, my friend and I started off with a glass of Moët & Chandon Brut Impérial NV (£13 glass/ £60 bottle). Bubbles in hand, and both feeling rather British, we opted for dishes we fondly remember growing up with. The Mini Yorkshire Puddings with roast beef, horseradish creamed potato and red wine sauce (£9) was a firm favourite. Proffering three larger than bite-sized Yorkshires, they made for a dreamy start to the meal. Stuffed to the top with the creamy mash, the potato oozes out of the sides with each bite and you're met with a subtle wave of heat from the horseradish. The generous portion still left a lingering pang of hunger to keep us excited for our main course. Sticking to my inner carnivore, I went for the 251g rib-eye (£22), cooked medium rare and seasoned perfectly for my taste buds. Presented on a wooden board, the steak came with a side of tenderstem broccoli and vibrant baby vine tomatoes that radiated a freshness I could sense before my first bite. Of course we had to order a side of the Crispy Roast Potatoes with rosemary sea salt (£3); it would be a travesty and unsuitably English if we didn’t accompany steak with some form of potato. 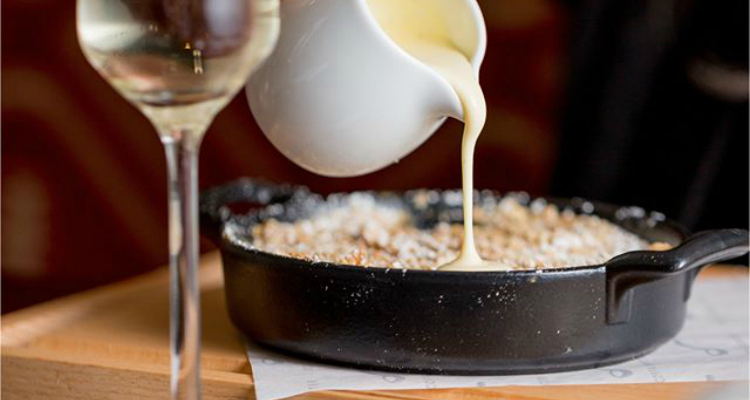 The Bramley Apple Crumble tastes just like how your Gran made it. Before long, we had tucked away the mains and quickly perused the list of undoubtedly classic British desserts. It was a hard decision to make when confronted with a choice of Sticky Toffee Pudding with caramelised Williams pear and butterscotch sauce (£6) or Bramley Apple Crumble (£6) which comes with your choice of cornish clotted ice cream or vanilla custard. In this unfair game, the crumble won and with each spoonful of the warm stewed apples, and sweet layers of the soft yet slightly crunchy crumble topping, I knew I’d made a choice my mother would be proud of. I washed it down with an Espresso Martini (ordered off menu), which perfectly balanced the sugary dessert, adding a counteracting bitterness to the dish, and rounding off the meal nicely. In the UK's sprawling capital it can be a rather mind-boggling chore to find a no-fuss traditional British menu, with friendly attentive service, and contemporary English furnishings to boot, but Scoff & Banter ticks all the boxes, making it a must-visit on any ‘Classic British’ restaurant hit list.